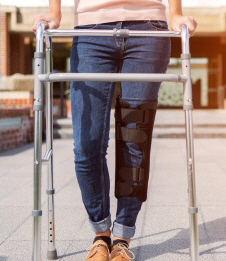 Each walking frame works differently and there are some different techniques for using frames, which depend on the frame and on the person using it. However, there are some techniques and tips that will help you get the most out of your walking frame, no matter what make or model it is. Make sure your home is free of loose rugs, trailing electric cords, cluttered floors, and other things that could get in your way and trip you up. If you have stairs, buy separate frames for upstairs and downstairs – don't try to take one frame up and down the stairs. Keep the walking frame near where you sit so you don't have to walk to get it. When you are walking, keep the frame a little bit in front of you and walk between the handles. Be careful around any pets, as they can get in the way of the frame and trip you up. Make sure you know how the brakes work and how to lock them – you will need to do this before sitting on the seat, if your frame has one. Whenever you use the frame, make sure you're wearing appropriate, supportive footwear. If your frame has a tray, make sure it is level so drinks don't spill when you use it. Make sure you know how to attach and remove the basket and tray, and how to unfold the frame for when you're putting it in a car. Get your frame checked regularly for signs of wear and tear. If there are any problems and your frame is funded by Enable New Zealand, call 0800‑171‑995 to arrange for it to be checked. If you bought the frame yourself, get it checked by your supplier, or any of these equipment suppliers. Don't use the frame to pull yourself up from a chair as you could end up pulling it on top of yourself. You should push yourself up using the arms of the chair, and hold the frame once you are standing. You can read more about getting into and out of a chair. Never use the frame on a wet floor, because the wheels or stoppers may slip. If you need help learning the best way to use your frame, you can ask a physiotherapist or occupational therapist to visit you in your own home to make sure you are getting things right. Snowden, J., Choosing a walking frame, On the Go Physio, Christchurch. 2011. South Canterbury DHB, Walking frame, Authorised by: S Matta, SM, R Templeton, DOAH. Last reviewed February 2016.